Finca Exotica is a sustainable eco lodge, built on the foundations of land preservation, organic food production, sustainable building, community outreach, and education programs for guests and locals. The environmental impact of this farm is constantly under review by experts and the local staff to minimize our footprint. As a responsible green lodge and current caretakers of this land, we aim to craft our consumption patterns and use of mother earth wisely. Sustainable development for us means enjoying the fruits of our labor in ecotourism, education, organic agriculture and research while protecting 125 acres of pristine rain forest and regenerating 90 acres of former cattle pasture. Finca Exotica eco lodge started with the vision of a permaculture farm, and with sustainability in mind we have written and follow policies related to staff duties, clean energy, low impact construction, product selection, and responsible waste management. After 10 years of planning, planting and pampering the grounds, we started giving the plants a boost, laying out a schedule of planting and landscaping to revitalize the farm. The organic garden soil is primed to receive a mixture of plants. We are creating an edible hill right in front of the kitchen, planting a larger variety of fruit trees, various wild native greens, native tubers full of protein and minerals and ornamentals that frame the rejuvenated landscape. All constructions are designed to leave the smallest possible footprint, built in a way so that they will be returned to mother earth when no longer being used. As we began constructing the green hotel, we focused on using bamboo and thatch to the extent possible. Minimal amounts of wood were utilized and cement was poured only in the kitchens for hygiene reasons. The wood that was employed in the constructions is sustainably sourced – the end cuts and other scraps that are considered collateral damage in the whole logging process are still from the same excellent hard woods, but the market does not promote their exploitation for reasons of aesthetics and efficiency. We contacted the loggers directly and created a market – telling them that we are exclusively interested in these cuts that are typically thrown aside. Constructions are spread throughout the farm to lessen the impact and maintain a corridor for wildlife. Tucked into the palms, heliconias and mango trees, here you become immersed in the most authentic experience with nature. Bamboo has long been used as a building material but is just starting to infiltrate western building styles as an alternative to wood. As bamboo is a grass it grows fast and can be easily managed and harvested. We planted a large variety of bamboo species in the first years on the farm with the intention of creating an on-hand supply of sustainable building materials. Now we draw from this abundant source when new constructions are being designed. 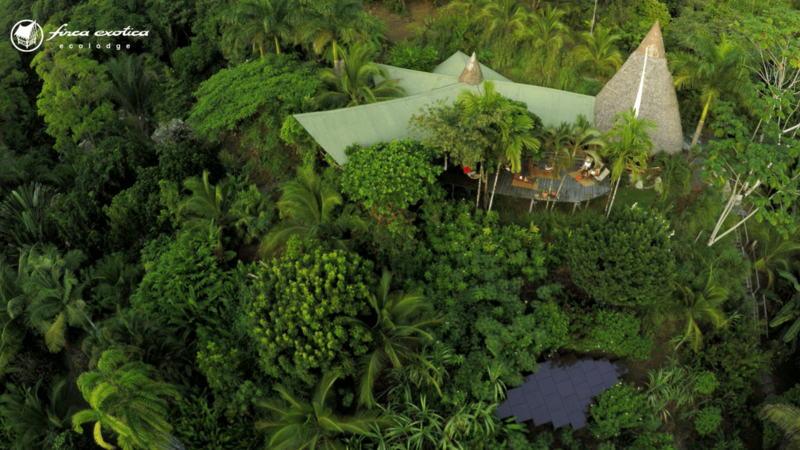 Finca Exotica eco lodge runs 100% on renewable energies. We utilize a combination system of water turbines and solar panels to adapt to nature’s rhythms of the seasons. We depend primarily on our 25 solar panels in the summer season, diminishing withdrawal of water from the natural spring to eliminate potential impacts on the ecosystem. In the rainy season, when the cloud cover is extensive, we rely on the abundant volume of water to power the Stream Engine water turbines. All clothes are dried using solar energy in our covered drying room. We plan to be producing methane gas to cook with, from our pigs and using a biodigestor. Interested in seeing permaculture in action, or even getting your hands dirty alongside us? We love to share our knowledge and get people involved first hand. At Finca Exotica eco lodge you can enjoy tours of the farm, volunteer in current projects or read from our extensive library on permaculture, botanical plants and health to build up your knowledge of sustainable living. We are currently developing workshops and a more extensive education program for you to learn sustainable practices that apply here and in your own home. If you want to learn more about how we are applying the principles of permaculture, join us on a sustainability/farm tour where Markus offers anecdotes about the trials and tribulations of the first years on the farm and presents you with the possibility to try exotic new flavors that come in all shapes and sizes. We also invite professors and students studying organic agriculture or ecology to come and apply their skills here on the farm or in the jungle. Our green farm includes a large variety of ornamentals and edible plants and we love to share and exchange knowledge about this amazing sustainable life system. Finca Exotica eco lodge offers 7 hikes covering over 14km, providing easy access to some of the most diverse old-growth rainforest in Central America the perfect laboratory to engage in biological research. The development of sustainable tourism must be seen as the balanced interaction between the use of our natural and cultural resources, the improvement of the quality of life among local communities, and the economic success of the industry, which also contributes to national development. Sustainable tourism is not only a response to demand, but also an imperative condition to successfully compete now and in the future (Definition of Sustainable Tourism, CST 1997). Support Costa Rica´s impressive national park system by organizing a tour to Corcovado, and other national parks. Buy local produce and support locally-run hotels and tour operators like Finca Exotica. Be mindful of the amount of water and energy that you use while on vacation. Take advantage of our towel reuse program. When visiting natural areas, make sure not to leave trash behind- please bring it back to our lodge. Participate in our recycling program and place trash in the correct bin. Practice your Spanish! Most of our workers are from the local area, it really is a great way to get in touch with local culture and customs. Let us know how you feel we can improve our sustainability policies. Take advantage of our library area and learn a few words of the local language from one of our dictionaries. Ask one of our staff about local conservation and social projects which you can visit and learn how to support while staying with us. Do not buy products made from endangered species, hard woods, or ancient artifacts. Use environmentally friendly airlines like Nature Air, use public transport, hire a bike, or walk when convenient. It´s a great way to meet local people on their terms and reduce pollution and carbon emissions. Try to use biodegradable soaps and detergents when possible. When driving, stick to marked paths and roads. Be aware when driving at night that animals can scare easily from headlights and loud noises and may be prone to leaping onto the road. Eat where locals do, not only will this give you a better insight to the cuisine of Costa Rica, but it will also help to support the local economy. Bring a water bottle with you instead of continually buying various plastic bottles of water. Much of Costa Rica´s water is drinkable but always check beforehand! We established internal procedures for food disposal, chemical usage, energy consumption, and customer interaction. You can enjoy clean solar and hydro energy in the community locations to read your book at night, listen to music, or have that cold beverage. Soon we will be producing methane gas from the pig farm. The lodging you will be staying in is mostly built to return to mother earth when it gets old. Most of the materials are wood scraps, bamboo, palm leaves, etc. You can be sure that the equipment, food, and other purchased materials utilized to serve you have been evaluated for sustainability. Our organic waste gets added to the compost or pigs food while recyclables go to Puerto Jimenez recycle center. Finca Exotica eco lodge is part of and was the founding member of the “Refugio Saimiri de Vida Silvestre Mixto”, an Osa Peninsula wildlife refuge established in 2007 to protect over 300 acres of land. The refuge is home to most of the species hat live on the Osa Peninsula: 400 species of trees, 160 species of mammals, 300 species of birds, 25 species of reptiles, 30 amphibians and 1000’s of insects, making this one of the most biologically diverse places on the planet. In the beginning Finca Exotica’s property consisted of abandoned cattle pasture mixed with primary forest. After years of natural regeneration enhanced by planting of native species, 95% of the Finca Exotica property was set aside exclusively for conservation purposes. In 2007 we began looking into the possibility of formalizing this intention by creating a wildlife refuge to protect the unique ecology, biodiversity and landscape from the encroaching threats of deforestation, hunting, and the expansion of the agricultural front. Hence, all of Finca Exotica’s property, along with 6 neighboring properties, lies within the limits of the SAIMIRI Wildlife Refuge. This expansive border ensures that the southern buffer zone of Corcovado National Park offers a continuous protected area where wildlife can seek a home, and that all the wildlife found in the park can also be spotted at Finca Exotica. The official management plan for the SAIMIRI Wildlife Refuge is in our library, where we welcome you to read it. It was elaborated in 2007 in conjunction with a biologist with years of experience in the Osa Peninsula. The plan describes the flora and fauna, and zones the property into 3 different zones of use/conservation, whereby 82% of the total area is declared an area of full protection, going far beyond the minimum requirements of the national refuge program. Additionally, it regulates the rights and obligations of landowners as well as the program of monitoring and research by the Ministry of the Environment (MINAET). The law and regulations that apply to those properties voluntarily registered in the refuge limit the dimensions and methods of construction and the use of designated areas to education, research and ecotourism.